Running out of storage space? Rubbermaid Sheds are a great answer to your storage problems. Adding a storage shed to your property will not only solve your storage needs, but will also add value to your property. Rubbermaid is certainly a well know brand when it comes to storage. Nearly every household in America owns at least one Rubbermaid storage container. They are a trusted name and offer quality storage products. So why not take a look at Rubbermaid for your storage shed needs? Rubbermaid sheds are made of thick, heavy-duty plastic called polymer resin. The sheds are pre-fabricated and available in many different sizes. Because they are manufactured with polymer resin, there in no maintenance or painting required. There is no need to worry about rotting, rust or weather damage. They are waterproof and will hold up in bad weather. They resist denting as well. Unfortunately, there are not any customizing options with Rubbermaid Sheds so matching your home’s exterior isn’t possible, unless your home looks like a Rubbermaid Shed. You can add shelving packages to your Rubbermaid shed. But as far as color or style choice, there isn’t any. There are two different types of Rubbermaid Sheds to choose from. There are Vertical sheds or horizontal sheds. Rubbermaid Sheds come in many sizes. There is an extra small Vertical Storage Shed which has 17 cubic feet of storage capacity. It is 2’2”w X 1’7”d X 5’7”h that run around $250.00. 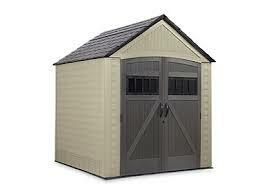 This shed would be a great choice to store painting supplies or cleaning supplies. The Rubbermaid Big Max Jr. Shed has 147 cubic feet of storage capacity. It costs around $499.00 and 82.8in w X 39.6”d X 91.2”h. It includes lockable doors and wide double door entry. The doors are steel reinforced to give them added security. The Big Max Jr. is perfect for storing all of your lawn and gardening equipment. You can easily organize your trimmers and mower. Add shelving to hold your gardening pots, gloves and spades. The Big Max is 325 cubic feet or storage. It is 6’9”q X 6’9”d X 7’7.5”h. The Big Max includes 2 skylights, lockable steel reinforced doors and 2 front windows. The Big Max would be a great place to park your riding lawnmower. Hang your rakes, shovels and blower to keep your floor space clutter free. Add your children’s bicycles to free up some space in your garage. The Big Max Ultra offers 467 cubic feet of storage space. There are 2 windows and 2 skylights to allow plenty of natural light in. This shed is unique because it is equipped with double doors on the front as well as the back. There is plenty of storage space to keep your outdoor equipment organized. Dimensions are 6’9”w X 10’2”d X 7’6”h. The Big Max Ultra is only available through The Home Depot. The Roughneck Large Storage Shed is a great shed to use for storing bicycles, skateboards and other outdoor games and equipment. It has 159 cubic feet of storage capacity and is extra deep. The dimensions are 55”w X 76”d x 77”h. The horizontal storage sheds are a great alternative to the standard sheds if space is limited. There are several horizontal storage shed options with Rubbermaid Sheds. There is an 18 cubic foot horizontal storage unit that costs around $200. These sheds work great on patio’s, porches and decks and can be great storage space for pool supplies or pool toys. The pre-fabricated shed needs to be assembled. Assembly is quick and easy. The roof and walls simply snap together and then are secured by screws. Rubbermaid Sheds can be purchased at many of the local retail stores, like Wal-mart, Target and Home Depot. Locating a good price on the sheds is quite possible. They are already reasonably priced, but you may be able to find them on sale. You have to check their website because not all Rubbermaid Sheds are available on the website. Rubbermaid Sheds are certainly an option for your storage needs they are reasonably priced and are very, very durable. They do, however, lack in style and the ability to customize them to match the structures currently on your property. If you need the extra storage space that a backyard shed can bring and aren’t too worried about the appearance, the Rubbermaid Sheds are a great buy. Visit their website, or check your local hardware and home improvement stores to locate the Rubbermaid Shed that is perfect for you.